It is hard to believe that a new year is upon us. It seems like yesterday I was reflecting on my one word for 2016 and preparing a blog post with a friend. Each year seems to go by faster, both personally and professionally! 2017 is here…and I am ready! My journey to finding THAT word was a struggle this year. I even found myself fighting against what was staring me in the face. I had it all along, but I just didn’t see it. The struggle was REAL, friends! The fact is, it should be a struggle. In order to grow and to set goals that challenge us, we must be uncomfortable. It requires owning up to mistakes, failures and weaknesses. It forces us to think about what we lack in order to be where we want to be. The struggle is part of the process, and I am happy to say that it was worth the time and effort. CHAMPION. Out of context most would assume it refers to the winner of something; someone who comes out on top of a competition. As I read my friend’s words, I realized what she was trying to help me see. She knows my heart, and through many deep conversations we have shared, she knows my goals. She linked me to the word CHAMPION as a form of action! To champion for something means to fight for it, which is what educators do every day. We fight for kids, their education, and for what is best for ALL of them. I have my word, and a song to represent it. I am a fighter. I stick up for what I feel is right. I champion for kids. I champion for the profession I care so much about. I champion for public education because I know it is what our kids need. I champion for change in politics that impact public education in a negative way. I am ready to fight. My ammunition? Fighters need it. I have it. My weapons are strong enough to take on whatever I may face, and will help me grow both personally and professionally. I will use all of it, and will borrow ammunition from others when I need it, and from God when I am at my weakest. Faith challenges us because it cannot be seen. Trusting something we cannot see is not always comfortable. I will champion with faith at the forefront. It will be my shield of armor to protect me from swaying. Through faith I can champion with self control and with love. Fear will not be a factor. Look for the hashtag on Twitter! The negativity in our world is everywhere, especially on television and social media. The power of positivity is something I believe in fully, and we simply cannot have enough inspiration! Some call it fluff, but I consider it a lifeline for championing. I need to be uplifted, and I need to uplift others. 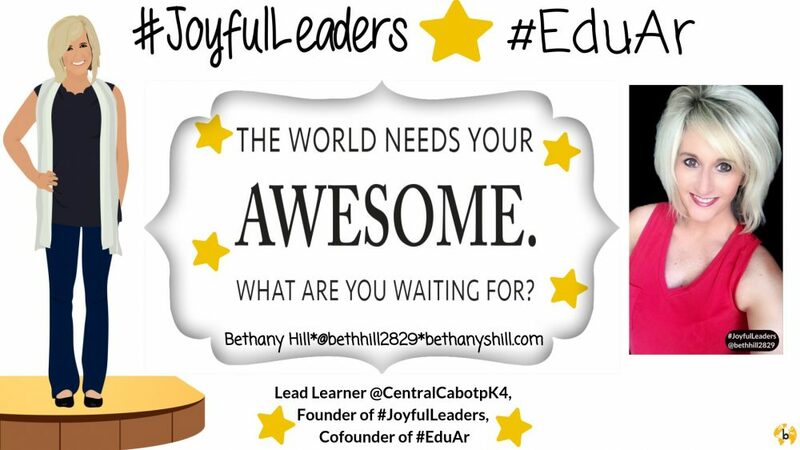 #JoyfulLeaders has helped me begin to fulfill my purpose…to champion for positivity, and remind leaders the WHY of leading. People without hope break my heart. They need joy, and it is up to others to support them until they can find it from within. I am stronger because of the people I choose to surround myself with, and feel so much comfort in knowing that positivity is all around me. It is keeping me sheltered, and guarding my heart. CHAMPION. I will do this. I will CHAMPION for what is absolutely best for kids. I will CHAMPION for the best educators to serve kids. I will CHAMPION for my school’s culture to stay uplifting and empathetic. I will CHAMPION for individuals who need to find joy. I will CHAMPION for my own faith and positivity, and use it to empower others. I can do this. I will need help. I cannot succeed alone. Others will fight with me. A special person from my PLN helped me discover my #OneSong2017… “We are the Champions”. WE…because I will champion with others who are fighthing for the same things. WE are better together. 2017…here I come to fight like a CHAMPION! A special thanks to Karen Norton and Sean Gaillard for their continued positiviy and willingness to take on the craziness in my mind. This entry was posted in Edcucation, Leadership, Reflection, Relationships, School Administration, school culture and tagged #oneword, adult learning, Leadership, Relationships. Bookmark the permalink.